Some may object to putting root vegetables in cake. They say that the subterranean farmer’s market staples belong on dinner plates, not on dessert tables. To the naysayers I say, what’s wrong with having cake for dinner? This cake is so easy to make, there’s really no reason why shouldn’t be whipping one up right now. Wouldn’t it be nice if you could actually tell the truth at your next doctor’s visit? Yes doctor, I had a full serving of veggies every day last week. I’ve been getting all the beta-carotene I need. They say perfect eyesight is 20–20, but I’ve found that everything I need to see starts at around 350℉. 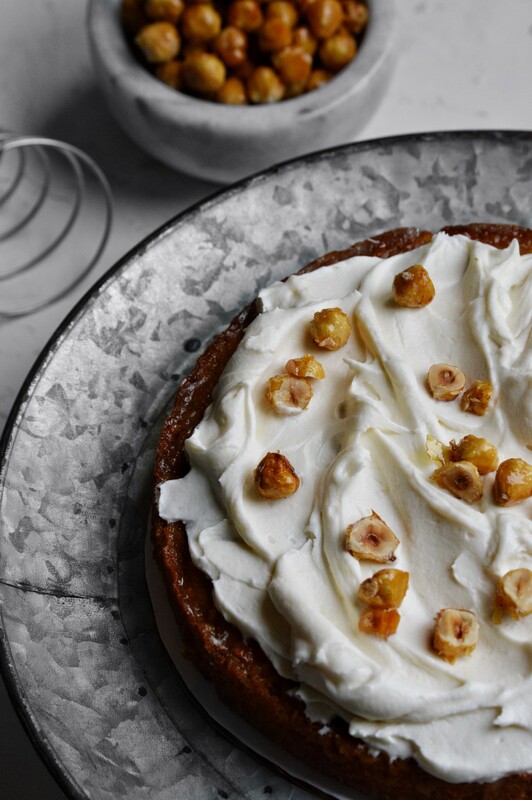 Whether you want to add the caramelized hazelnuts or not — please know that what follows is just a damn good carrot cake recipe that refuses to be beat. Let’s get to baking. I don’t like raisins — I’m going to start a movement, feeding elementary-age children raisins early on to socialize them to the golden sun-dried flavor troves of mediterranean wine country. In all seriousness, I know that a fair number of people are raisin-adverse — please feel free to substitute the raisins with dried cranberries, cherries, chopped dried apricots or even omit them all together. The cake will still be infinitely delicious! I can’t ice a cake to save my life — Icing a cake can be intimidating — that’s why this is a semi naked cake! It’s intended to be relatively messy. Just stack as much frosting as you’d like between all of the layers and on top, saving just a bit to plaster up the sides. I guarantee you that you won’t be thinking about how the frosting looks once you’ve tasted the first bite. In fact, your eyes will probably be closed and you’ll be rolling around the kitchen floor in a fit of cake-induced bliss. I suggest investing in an offset spatula. One of these babies will absolutely save your life in the kitchen, in ways you never knew it needed saving. Do I have to peel the carrots? — I’ve witnessed many a heated debate about this one. While the unpeeled carrots may look menacing from the outside, they provide a whole host of fiber, vitamins and minerals. I do peel the carrots sometimes, reserving the peeled off bits for stews and stocks, but you really don’t have to. Just scrub the carrots gently and cut off the little remaining piece of stem at the top and you’re good to go. Where did you get that cake stand? — The galvanized metal cake stand, which resembles an ancient family heirloom (believe me, I wish it was), it actually a fairly recent purchase, it’s available here at Wayfair. If you are referring to the beautiful white porcelain cake stand, it’s also available on Wayfair for around $30. What can I substitute for the canola oil? — I have a confession to make. I don’t even use canola oil to make this recipe. I use extra virgin olive oil. The EVOO adds a very subtle floral note that compliments the spiced carrot cake quite well. You can also use grapeseed oil, sunflower oil, or basically any cooking oil that is liquid at room temperature. My absolute favorite olive oil can be found here. This recipe is a lot. Can I just make the cake? — Do. You. It is just in my nature to be an ‘extra’ type of person, so I can never just make a cake, or just make donuts. I always have to throw in something crazy or new. 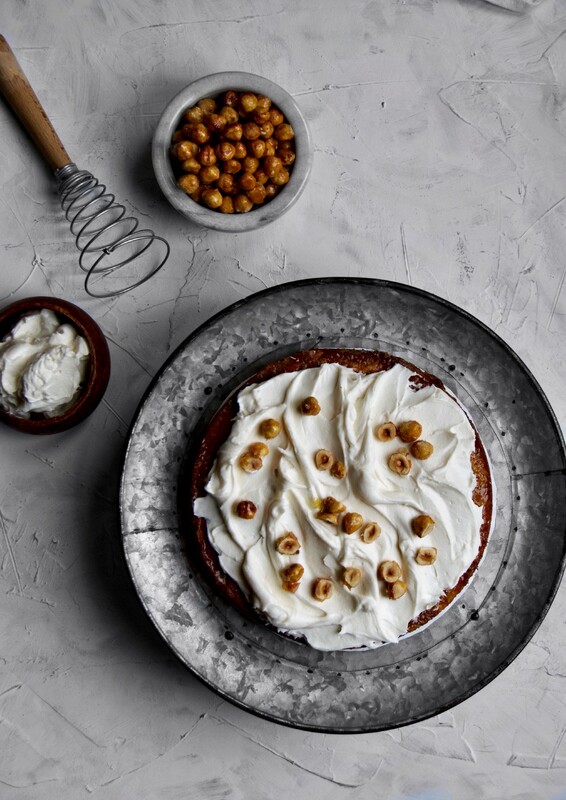 If you’re in a crunch (pun intended), or the idea of caramelized hazelnuts just doesn’t entice you, you can just follow the steps under ‘make the cake’ and ‘make the frosting and assemble’, and you’ll be good to go. Preheat your oven to 350°F (180°C). Grease three 9" by 3" cake pans and line with parchment. In a large bowl, mix the sugars, oil, buttermilk, eggs and vanilla, set aside. In a separate bowl, whisk together the flour, baking soda, salt, and spices until combined. Thoroughly mix the dry ingredients into the wet ingredients and set aside. Using a food processor or box grater, shred the carrots until fine. 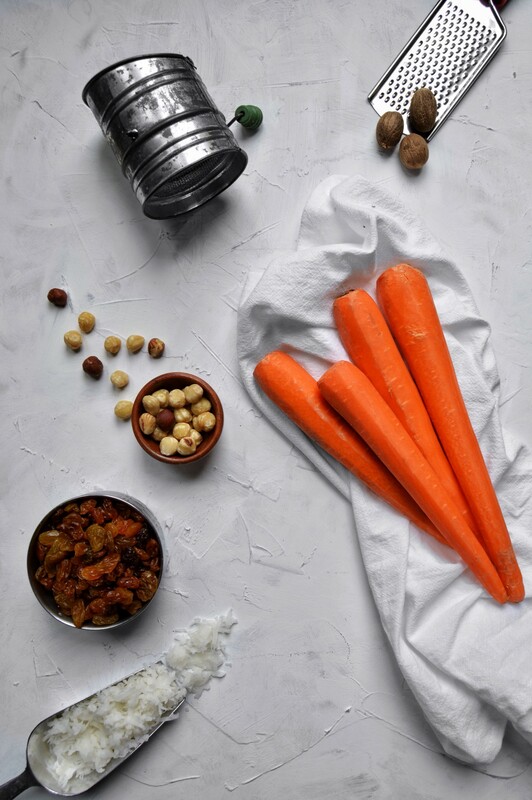 Gently combine the carrots with the chopped hazelnuts, crushed pineapple, raisins and shredded coconut. Gently fold the carrot and fruit mixture into the cake batter, making sure to scrape down the sides of the bowl. Divide the cake batter evenly between the three prepared cake pans. Gently tap the pans on the counter to remove any air bubbles and spread the batter out. Bake the cakes in your preheated 350°F (180°C) oven for 25 minutes, or until a toothpick inserted in the center comes out clean. Allow the cakes to cool in the pans. In a small saucepan, combine the sugar, buttermilk, butter and honey. Stirring occasionally, cook on medium-high heat until all of the sugar has dissolved and the mixture begins to bubble. Add the vanilla, baking soda and salt, stir, and remove from the heat. Immediately pour the cake soak on top of the cakes, right after they come out of the oven. Toast the hazelnuts in a 350°F (180°C) oven for 10 minutes, or until golden brown and fragrantly nutty. Stir occasionally to remove the skins from the hazelnuts. If the skins are stubborn and don’t come off during the toasting process, just gently rub the hazelnuts in a cloth or rag until the skins are removed. A little bit of skin is fine and will taste just as great! While the hazelnuts are toasting, add the sugar, water and salt to a small saucepan over low heat. After removing the nuts from the oven, add the still warm hazelnuts to the sugar syrup and stir to coat. Turn the heat to medium and cook the hazelnuts until they are a deep caramelized amber color with no clear or white sugar remaining. Watch and stir the hazelnuts so that the sugar does not burn. Remove from the heat and transfer the caramelized hazelnuts onto a sheet pan lined with parchment paper or a silicon mat. Reserve until it’s time to assemble the cake. Using a stand mixer or hand mixer, beat all of the frosting ingredients until fluffy and smooth. Start slowly so that the confectioner’s sugar doesn’t fly all over the place. Remove all of the cooled, soaked cakes from their pans. Using a cake board or cake stand, begin stacking the cake layers, dividing the frosting and caramelized hazelnuts evenly between each layer, saving some frosting for the sides and top. 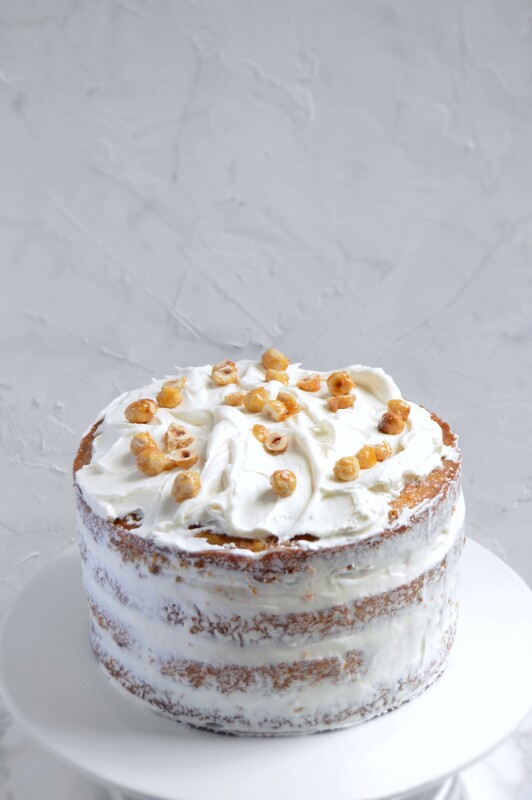 Make sure that you sprinkle the caramelized hazelnuts on top of each layer of frosting, so that you get some crunch in each bite. Use an offset spatula or cake scraper smooth the frosting on the sides and create swoops in the frosting on the top of the cake. Sprinkle the remaining hazelnuts on top of the cake. Cake can be eaten immediately or wrapped and refrigerated for up to 3 days.